Last week I decided to step away from the office desk and go out and get some fresh air, that and some lunch. Often times I find myself eating lunch at the desk as either I am too busy, or too lazy to get up and get out. Fortunately when I do get a chance to get out, I often chose to go to the local Mexican restaurant and grocery store, El Rey Supermercado. I’m not going to lie, I love their tacos, and their tacos love me. As I normally do, I check out, then cruise through their aisles, often picking up limes or avocados. As I quickly browsed through their homemade salsas (I love their salsa verde), one of them caught my attention. It was a chipotle tamarind salsa. That flavor profile really caught my attention enough to pick up a couple of simple ingredients and head home to make my own version. When I first noticed tamarind, I was completely unaware that the Mexican culture used tamarind in their cooking. I knew the Thai culture used it in many of their dishes, and I often use it when making pad thai, so I was really surprised, and excited to use it to say the least. Add the garlic, tomatoes, and onion to a baking dish. Add the oil and a pinch of salt and swirl the ingredients to lightly coat with oil. Place into the preheated oven to roast and slightly char, about 25 minutes. While the vegetables roast, add the tamarind juice and the piloncilloto a skillet or sauce pan. Cook on medium heat to soften and break down the unrefined sugar. Once it boils, reduce the heat to low. Once cooked, remove from the oven and let cool. Remove the skin from the garlic, and add them to a blender or food processor. Add in the tamarind and piloncillo as well as the cilantro. 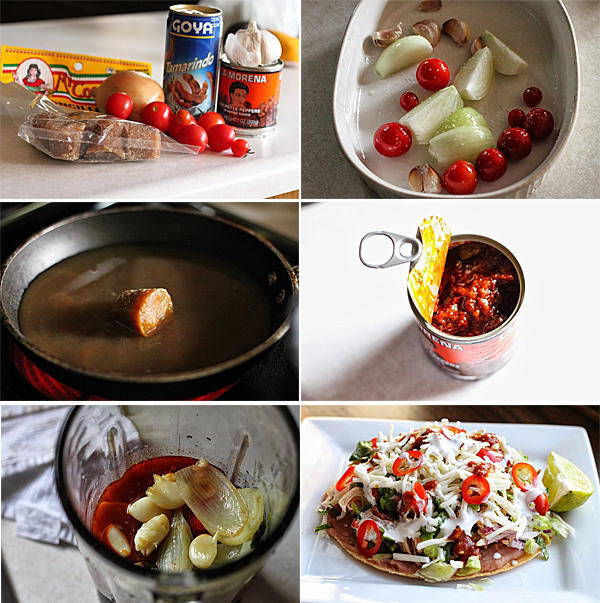 Add in the can of chipotle peppers, along with the adobo sauce. I just love that stuff. Blend until you have a nice, smooth sauce. Add in a bit of water if you want to thin it out a bit. This will make a couple of cups of sauce, and you can use it on pretty much anything. The chipotle tamarind sauce was pretty amazing. At first I was thinking it was just going to be too hot due to the amount of chipotle peppers, but it gets perfectly balanced by the sourness from the tamarind, as well as the sweetness of the onion and piloncillo. I’ve been drizzling this all over my eggs in the morning, as well as any Mexican food that I make during the week, such as these tostadas. 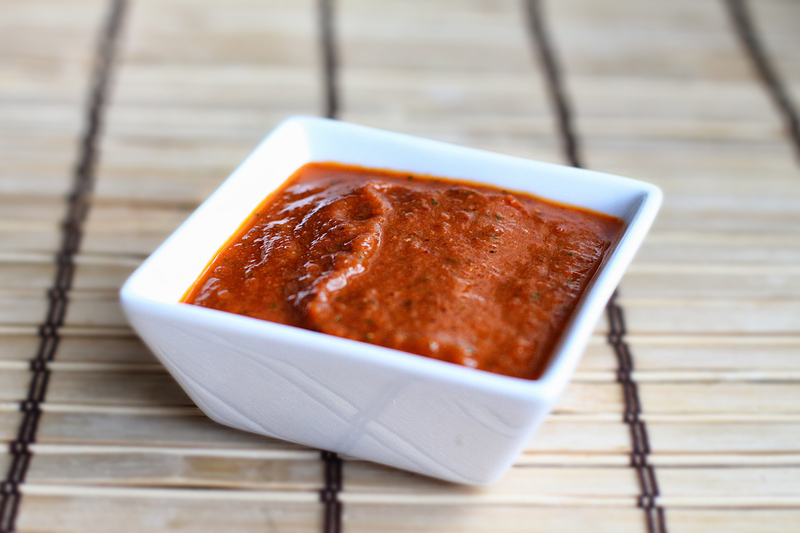 If you are looking for a great sauce that can be used on any meal, give this one a shot. I bet it would also be a great condiment on a sandwich, or heck even to dip some french fries in. Hope you enjoy!